From Contrarian Outlook: There are, as I write this, 3 high-yielding funds giving investors over 5% in dividend income. Plus they pay out every month, tax-free. All 3 sold off at the end of 2017. And I’m watching one group of investors who are waiting to buy back in when a “time limit” I’ll explain in a moment expires in the next few weeks. That makes now a good time to buy. Because when this “deadline” comes and goes, I expect all 3 of these funds to rise. Before I show you these funds, I want to give you the inside scoop on this unique situation. But, as I wrote in early December, this was a tempest in a teapot. The details are complicated, but the bottom line is that the most important types of municipal bonds will retain their tax-free status. What’s more, too many investors are hooked on getting an income stream the taxman can’t touch–meaning demand for these bonds won’t go away anytime soon. Nonetheless, I said December would be a weak month for municipal bonds, because, honestly, December is almost always sluggish for munis. That’s because the tax-focused investors who buy munis are the same kinds of folks who sell assets at a loss for the tax writeoffs–and most of that tax-loss harvesting (as it’s called) occurs during the last month of the year. At first glance, this might look worrisome–but it’s nothing to fret about. Because this January pullback stems from a tax law known as the “wash sale rule.” It simply says that an investor can’t claim a loss on the sale of a security and then buy it back instantly; he or she must wait 30 days before doing so. 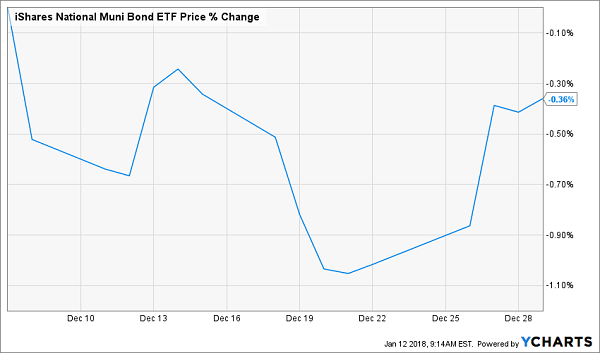 This means that a lot of muni investors who sold at the end of 2017 are waiting to buy back, so an uptick in municipal bonds is coming, and perhaps even by next month. Secondly, we’ve seen a pullback in municipal bond buying in those states where cold weather has been particularly intense. New York, New Jersey, Wisconsin and Illinois have seen some pretty big fund withdrawals from their muni bond markets. This is all because investors are worried that the big freeze also froze economic activity, lowering revenues that will inevitably hit municipal bond solvency. This is a big, emotional response to a tiny non-issue. We saw similar cold weather at the start of 2014, and that had no long-term impact on cold-weather states’ municipal bonds or those states’ tax revenues. This is a silly selloff. And that means the serious investors should come in and buy with both hands. So which muni funds are set to lead the way? Let’s start with the kind of fund you should avoid. The PIMCO CA Municipal Income Fund (PCQ) is a perfectly respectable California-only municipal income fund managed by one of the best bond managers in the world: PIMCO, whose legendary bond picking turned it from a small Newport Beach startup to an international heavyweight with $2 trillion in assets under management. Yet PCQ isn’t worth buying now, because it’s expensive, trading at a massive 22.6% premium to net asset value (NAV). That means you’ll pay $1.226 for every dollar the portfolio is worth–this is a fund for suckers who love overpaying! But PCQ’s 5.3% tax-free dividend yield is nice–so let’s beat it with a fund selling at a 6.4% discount to its NAV. That’s right–a higher dividend income stream and a portfolio that’s being sold for less than its true market value. That’s what you get with the MFS Municipal Income Fund (MFM), which yields 5.5% and has been out-earning its dividend for a long time, making that income stream sustainable for many years to come. 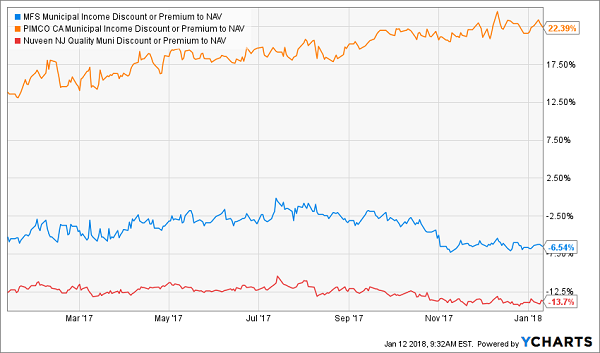 Another important thing about MFM: over the last year, it has protected its NAV, despite a tough year for municipal bonds, by choosing holdings carefully, while PCQ’s NAV has been going down. MFM isn’t the only fund that looks poised to gain as munis come back into fashion, though. Take a look at the Nuveen NJ Quality Municipal Income Fund (NXJ). 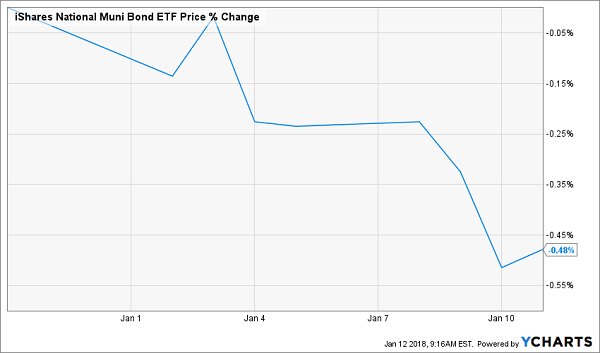 Despite having one of the highest total returns among municipal bond-focused closed-end funds, NXJ trades at the biggest discount of any muni CEF–a full 13.8%. But NXJ is covering its 5.1% dividends through the tax-free income on its munis, and it’s growing its NAV, too. The market doesn’t care–investors are selling this fund off because it’s been a bit chilly in New Jersey. But they’ll change their minds soon. Finally, another underappreciated muni fund with a big dividend is the Nuveen AMT-Free Quality Muni Income Fund (NEA), which looks for top-quality municipal bonds from across the US to add to its portfolio while also ensuring that taxpayers are exempt from the alternative minimum tax on the income they get from the fund. 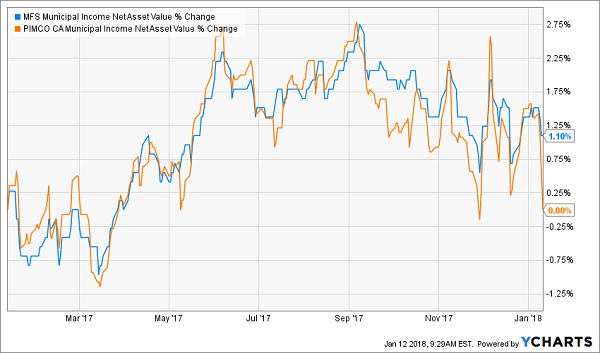 NEA’s tax-free yield is 5%, and it’s out-earned its dividend for years–which is why its annualized return is a bit higher, at 5.2% over the last decade. It’s also protected its NAV through good and bad times, including the 2007-09 Great Recession, so you know it plays good enough defense to survive tough times while providing a reliable income stream. These 4 funds are all set to gain from the muni comeback, but you can bank even higher yields and bigger upside in 2018 with the 4 CEFs my proprietary 5-point CEF-picking system just released. One of these incredible income plays even hands you a safe 10% dividend yield! And before you ask, yes, this payout is safe, easily covered by the gains and income this off-the-radar fund’s portfolio is generating. Here’s why: let’s say you buy $100,000 worth of this rock-solid pick today. When 2019 dawns less than 12 months from now, you’ll be sitting on a nice $10,000 in dividends alone. Sure, the income is great, but that high yield also gives you some extra insurance because it means you’ll have already recouped 10% of your original buy in cash! In 10 years, those outsized dividends will have handed you your complete investment back in full. Because thanks to each of these funds’ outsized discounts to NAV, I’ve got each one pegged for easy 20% price upside in 2018–including our incredible 10% yielder! That means our hypothetical investor above would already have a nice $30,000 in gains and income on this one fund alone as New Year’s 2019 rolls in! The iShares National Muni Bond ETF (MUB) was unchanged in premarket trading Monday. Year-to-date, MUB has declined -0.63%, versus a 5.08% rise in the benchmark S&P 500 index during the same period. MUB currently has an ETF Daily News SMART Grade of B (Buy), and is ranked #16 of 38 ETFs in the Municipal Bonds ETFs category.